The text for this collagraph was from a misaddressed hand-written postcard that arrived at our house not long before we set off for the Harvard Forest. On the front of the postcard was a picture of historic Williamsburg and this was all that was written on the back. 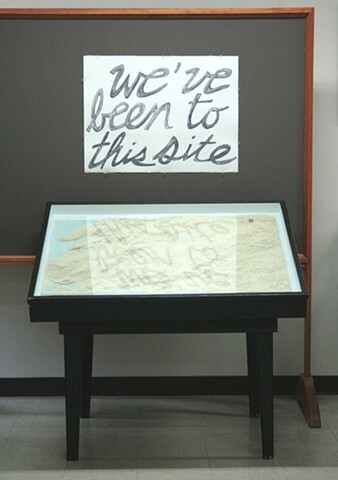 Jeremy enlarged the text by making each word into a shaped collagraph plate. We inserted the print in the museum directly above a topographical map of the Harvard Forest at the entry to the exhibition. We've been to this site.